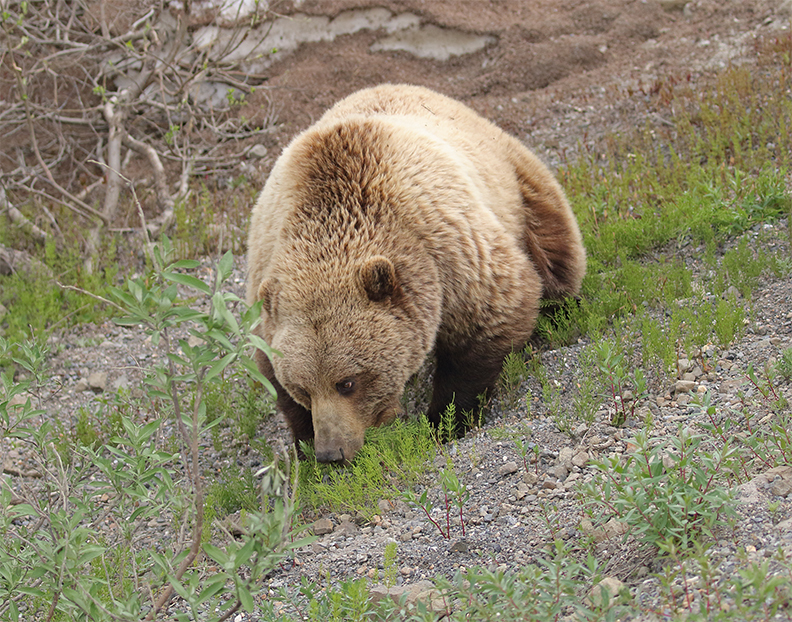 The next to last day at Glacier I was able to get a couple of photos of a grizzly feeding in the bushes. Unfortunately when I headed out that time I did not put the long lens in the truck, just the camera bag with other lenses, this was a mistake and one I won’t make again. Last night after hitching up the trailer and dumping the tanks in preparation to leave first thing this morning I wasn’t driving anywhere. It looked like it was clearing and sure enough about 11 pm it was very clear out and the Milky Way was visible in all its glory above the mountain. I got out the camera and tripod, set up in the road next to the trailer and took about 12 images using 2 different lenses. Well worth the effort! To my delight I captured a couple of meteors along with the Milky Way. Always fun to see the night sky!